We are the witnesses. We see what has gone before... what happens now... what's going to happen, what will surely happen unless we come together---we, the Peoples of all Nations---to restore peace, harmony and balance to the Earth, our Mother. ~ Chief Arvol Looking Horse, "White Buffalo Teachings"
We are like the tree standing in the middle of a bushfire sweeping through the timber. The leaves are scorched and the tough bark is scarred and burnt, but inside the tree the sap is still flowing and under the ground the roots are still strong. There are deep springs within each one of us. Within this deep spring, which is the very spirit, is a sound. The sound of Deep calling to Deep. The time for rebirth is now. If our culture is alive and strong and respected it will grow. It will not die and our spirit will not die. I believe the spirit of Dadirri that we have to offer will blossom and grow, not just within ourselves but in our whole nation. 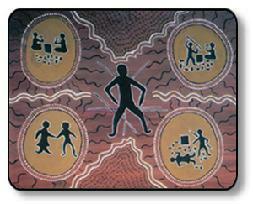 Edited version adapted from writings of Miriam Rose Ungunmerr-Baumann, a Ngangiwumirr woman from Daly River.